After low-key announcing his ninth studio album Revival through a brilliant pharmaceutical marketing campaign, rumors heavily pointed to a November 17th release date. As it stands, the hype train is in full effect, and Em's upcoming project recently had a booth at ComplexCon, in which a booth was set up advertising the fictional "Revival" drug. Overall, the campaign surrounding the album is A+, especially for an artist like Em, who seldom deviates far from the traditional methods of release. With the reported date around the corner, we still have yet to hear a lead-off single. Although, according to a new report from NME,that may be about to change. Apparently, Eminem is planning on "launching" Revival at the upcoming MTV EMA's, with what's teased to be a "massive airing" of the album at London's SSE Wembley Arena. According to The Sun, Em's new album is said to be "dropped" at the event, which includes a "massive performance." It's hard to say whether that means Em will be performing new music from the album, or simply launching the project through a massive listening party like N.E.R.D. recently did, but either way, it's becoming evident that Revival season is upon us. In truth, we don't know much about Eminem's album, save for the fact that he's working with Dr. Dre, Rick Rubin, and 2 Chainz. There's no doubt it will feature, at the very least, some political themes, given the nature of his recent BET cypher. 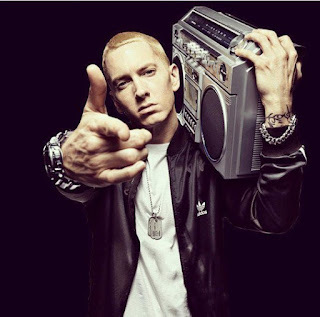 Apparently, The Sun claims that Em is "relaunching his career after a few years out and gathering his thoughts," which indicates that he'll be touching on a variety of topics. After all, a lot has transpired since Em's last studio outing back in 2013. Suffice it to say, it won't be long before we're taking in a new project from Marshall Mathers. Are you hyped for this? If so, tune into the MTV EMA's this Sunday, November 12th, where Eminem is reported to be "launching" his album.